Voices of Mississippi: Artists and Musicians Documented by William Ferris is an important addition to the documentation of Southern folklife, culture, and history. 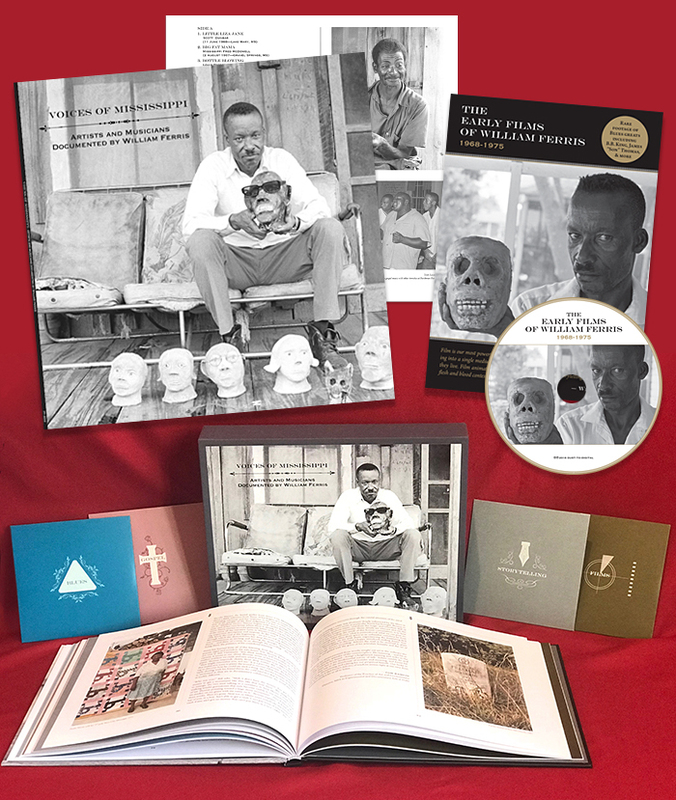 The box set includes a CD of blues field recordings, another CD of gospel field recordings, a disc of interviews and oral histories, a DVD with seven short documentary films (1972-1980), and a 120-page hardcover book edited by Ferris that includes transcriptions and annotations for all of the film and album recordings. A recently released companion DVD, The Early Films of William Ferris, 1968-1975, features rare footage of B.B. King and James “Son” Thomas. Both were produced by Dust-to-Digital in collaboration with the University of North Carolina, which holds the William R. Ferris Collection. Born on February 5, 1942 in Vicksburg, Mississippi, William “Bill” Ferris was always fascinated by the Southern folklore and culture that surrounded him. This interest led him to earn a PhD in folklore from the University of Pennsylvania in 1969. Ferris then served as a Professor of English at Mississippi’s Jackson State University (1970-1972), American and Afro-American Studies at Yale (1972-1979), Anthropology at the University of Mississippi (1979-1997), and History and Folklore at the University of North Carolina – Chapel Hill (2002-present). In addition to his teaching, Ferris also cofounded the Center for Southern Folklore in Mississippi, served as the founding director of the University of Mississippi’s Center for the Study of Southern Culture, and held tenure as chair for the National Endowment for the Humanities from 1997 to 2001. Ferris’ research primarily focuses on African American folklore, culture, and music in the South. He explored southern African American life through the medium of film, field recordings, interviews, photography, and writing. Voices of Mississippi serves as a representation of Ferris’ ethnographic work in the Mississippi Delta from the mid-1960s to 1994. The first CD— simply titled “Blues”— contains songs by blues heroes such as Scott Dunbar, Louis Dotson, and Sonny Boy Watson. The “Gospel” CD includes recordings Ferris made while attending the services of local black churches, at the Mississippi State Penitentiary (also known as the Parchman Farm), and during the rehearsals of gospel performers. In the hardcover book, ethnomusicologist David Evans provides commentary on both sets of recordings. He describes the third disc, “Storytelling,” as “a gathering of images, some full and whole with the certainty of a beginning, middle, and end, others like well-cropped photographs that narrow in on details, leaving what rests outside the frame for our own imaginations.” He goes on to add, “this is what it means to sit at the table of natural conversation.” These conversations include B.B. King talking about his guitar, “Lucille,” Bobby Rush explaining “The Blues,” Pete Seeger talking about the Civil Rights Era song, “We Shall Overcome,” and more. Lastly, there are two collections of documentary films by Ferris. The DVD included in the box set features films from 1972-1980 documenting the blues fife musician Otha Turner, mule trader Ray Lum, the life of four female artists, and more. 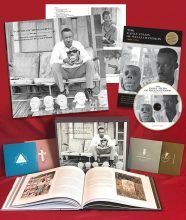 The Early Films of William Ferris (1968-1975) is a single DVD detailing the black Delta, life on the Parchman Farm, folktales, folk art, the “black church,” and the life of Mississippi Delta bluesmen. Obviously, Voices of Mississippi and The Early Films of William Ferris are collections that anyone who is passionate about African American life, culture, and folklore in the South should own. This entry was posted in African American Culture & History, Blues, Folk and Country, Gospel Music and Spirituals, Soundtracks and Spoken Word and tagged B.B. King, Blues, Bobby Rush, box set, Dust-to-Digital, films, folklore, gospel music, Kennedi Johnson, Mississippi Delta, pete seeger, review, Southern folklife, storytelling, Voices of Mississippi, William Ferris by aaamc. Bookmark the permalink.